In this tutorial we will show how to live stream from GoPro Hero cameras to Facebook Live using the Camera Remote app. 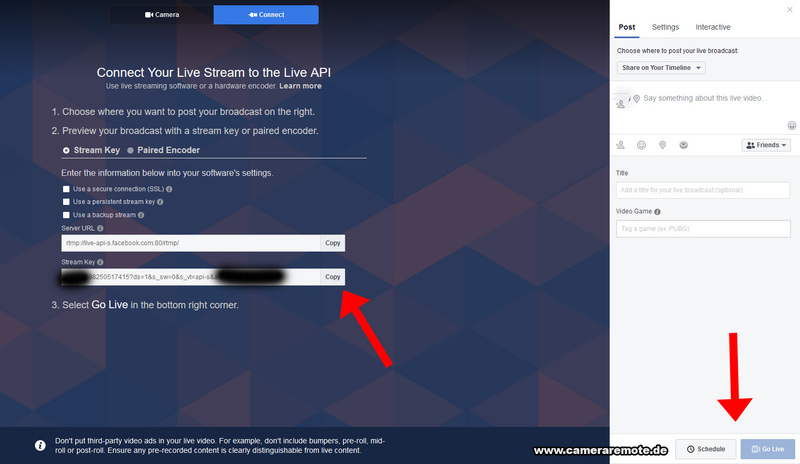 Replace “<YOUR FACEBOOK STREAM KEY>” with the Stream Key from the Facebook Live website as shown in the section above. Now open the Camera Remote app and connect to your GoPro camera. Then open and start the streaming server. Then press the “Go Live” button on the Facebook website as shown in the screenshot above. You should now see the live stream in the Facebook window and in the Facebook timeline (or wherever you selected to show the stream). Note that it can take some seconds until you see the stream.